Here it is ! I received it this morning. Really nice guitar, perfect condition. My L-00 is so happy to have a little sister ! Thank you so much for your business. Guitar just arrived and sounds great, many thanks. I went down to the Post Office and picked it up. Put a fresh set of strings on her and she’s singing real fine. Here’s my web page featuring the guitar. I also included a video that I think you’ll enjoy. Thanks again for bringing this guitar back to life. I wanted to thank you for taking the time to do that extra bit of work on that 1944 LG-2 Banner I just bought and for shipping it out promptly. This will be the third guitar I’ve purchased from Benn who I consider to be a very knowledgeable and reputable dealer. It’s nice to know that he has a guy like you looking after the guitars. Ben is adamant on every guitar being set up properly. I will send tracking number tomorrow. I have received the guitar yesterday evening! It´s a wonderful guitar! It sounds incredible and it has its own sound. I am very happy with it. I want to thank you for this guitar, all the free picks, humidifier and of course the wonderful guitar case. But most of al I want to thank you for the excellent service and taking such good care for this guitar (very well packed). I will recommend you to all my fellow guitarists! Kalamazoo KG11 and advise on a very good L00 he found and purchased elsewhere. Thank you so much man – you are too kind! I sure do love my Kalamazoo, and I am diggin’ in deep with my L-00 as well. I really appreciate you giving me such sound advice on which guitars to go after. 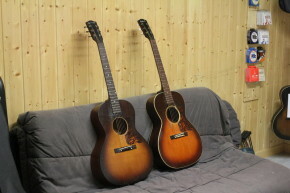 It is such a righteous experience to play those Blind Willie and RJ tunes on these old guitars. How often in life does something sound “right”? Let me know if you’re ever out my way – the beers are on me! Bill Phillippe is a fabulous San Francisco based singer song writer and professional musician. He produces some wonderful records that I value and keep cued up at home and in my car!! Benn…..she’s a keeper…all checks out well….great sounding ….one of the best I have played from a sound/tone perspective…. Just wanted to let you know the guitar arrived safely! I’m very happy with the guitar, got to fiddle with it a little more and I do love it! Hi Benn, I’ve already received the guitar and this is awesome!! Benn: Got the guitar- great! No problems. Thank You!